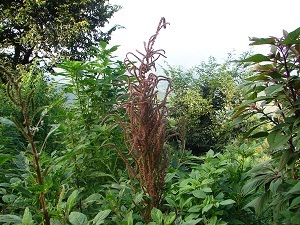 Himalayan Amaranth is also called Ramdana, “Grain of Lord Ram”. This name alone indicates the immense value of this grain. A super food of highest importance, a solution for the nutritional deficiency of unlimited amount of people. A rain-fed crop of utter beauty and glory. The references attached are a small selection of the vast research and documentation on this miracle, sacred grain of Lord Ram. 1. The amaranth grains are smaller than the grains of quinoa. 2. When compared to amaranth, the quinoa has a bitter taste. This bitter taste is because of the saponins coating in quinoa, which is not present in amaranth. 3. Amaranth is more used in curries, soups and casseroles. On the contrary, quinoa grains are more used in salads and fry dishes. 4. When cooking, the quinoa grains have to be rinsed many times to get the coating off. 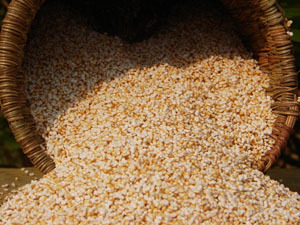 On the other hand, amaranth grains do not need to be rinsed many times. 5. 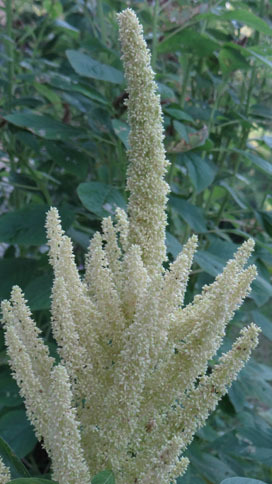 Though amaranth and quinoa has the same nutritional contents, amaranth is known to be high in proteins, especially Lysine. Quinoa only comes second to amaranth in terms of Lysine. 6. Amaranth has more fibre content than quinoa. 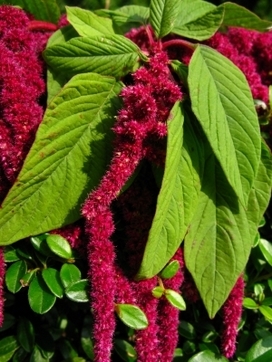 Moreover, Amaranth is the only cereal that contains large amounts of phytosterols. excerpt from this site: Considered a pseudocereal unrelated to wheat or other true grains, amaranth not only delivers high-quality protein — roughly 17 percent by weight — but also contains plenty of other healthful nutrients. Its high levels of the amino acid lysine help your body to properly absorb calcium from the digestive tract. For those interested in increasing their calcium intake, amaranth flour also has twice as much calcium — ounce for ounce — as cow’s milk, according to “The Thrive Diet.” Amaranth flour is also rich in fatty acids and includes tocotrienol, a potent form of vitamin E. Amaranth flour has roughly five times the iron and three times the fiber of wheat flour. 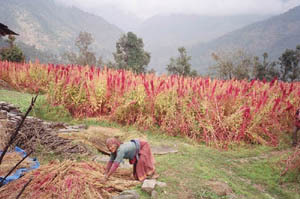 It’s also rich in other micronutrients, including potassium, phosphorus and, vitamins A and C.
excerpt from this site: Amaranthus species were grown as the principle grain crop by the Aztecs 5,000 to 7,000 years ago, prior to the disruption of the South American civilization by the Spanish Conquistadors. Synonyms such as mystical grains of the Aztecs, super grain of the Aztecs, and the golden grain of the Gods were used to describe the nutritious amaranth grain. 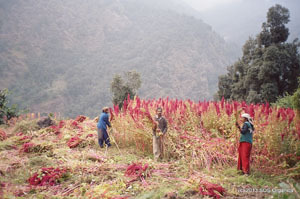 excerpt from this site: The food value of grain amaranth was recognized by people from Mexico to Peru to Nepal long before any, nutritional analyses had been conducted. Because grain amaranth is easy to digest, amaranth is traditionally given to those who are recovering from an illness or a fasting period. excerpt from this site: This tiny grain is amazingly versatile. It can be boiled in water, like rice, as an accompaniment to a meal, into a porridge or as the base for desserts. It can be puffed (just like popcorn or rice puffs) or flaked and used as a breakfast cereal or in savoury recipes like gratin, as a topping.It can also be ground into a flour which is great for sweet and savoury baking. Because it is a seed, it can be sprouted and eaten as a vegetable. 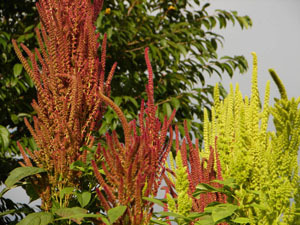 excerpt from this site: Amaranth seeds are a rich source of squalene. Squalene performs as a strong antioxidant, being able to reduce or remove harmful effects of pollution in the body caused by toxic substances from the environment including car exhaust fumes and industrial wastes. The benefits of improved health have become evident for people who had previously suffered with chronic fatigue, when they took squalene. In the past, shark and whale liver oils have been the main sources of squalene, but rather expensive. Recent research shows that amaranth oil has almost 8 times the amount of squalene as shark liver oil, and is a more acceptable source for vegetarians. New research shows that squalene may inhibit the growth of tumour-induced new blood vessels, and also may reduce the spread of tumour metastases and significantly reduce the growth of lung, breast, prostate and brain tumours, and in certain cases eradicate tumours. Squalene has also been used for control of allergies, diabetes, candida, pain, arthritis, asthma, and to improve memory function. Researchers have said that squalene is perhaps the most amazing immune enhancer, ever discovered.